Compare Best Cordless Drills: DeWalt or Black&Decker? Whether you're handy around the house or not, a good cordless drill is a very useful tool to have. Today's cordless drills are lightweight and compact in design, allowing the execution of a variety of drilling tasks with power and ease. They bring convenience and ability to tackle difficult and often awkward jobs. The main factor that determines the power of a cordless drill is the voltage of its battery. Higher voltage means more torque -spinning strength to overcome resistance. Even though cordless drill battery voltages can range anywhere from 4V to 30V, batteries used by the most popular models have a voltage that ranges between 12V and 20V. This is because the power provided by these batteries is more than enough to tackle drilling jobs around the house or in your garage, such as hanging pictures or light fixtures, installing handles on cabinets, or replacing door hinges. Cordless drills use two types of rechargeable batteries: either nickel–cadmium (NiCad) or lithium-Ion (Li-Ion). Both types of batteries come with their pros and cons, and these are explained below. Selected DeWalt and Black&Decker Cordless Drills on Amazon. Otherwise, please continue reading below for a detailed comparison of the DeWalt DC970-K2 and Black&Decker DX120C cordless drills. 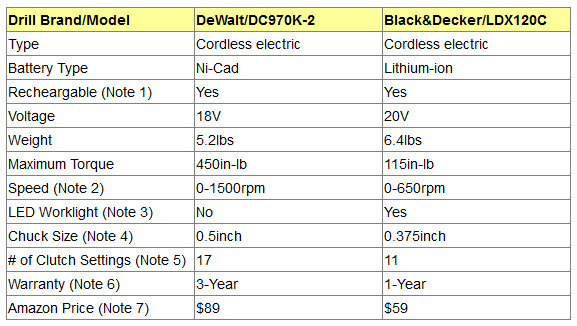 Note 1: DeWalt DC970K-2 requires two 18-volt NiCAD batteries which are included in the purchase. Black&Decker LDX120C requires one 20V battery which is also included. Note that both products also come with the battery chargers. Note 2: The DeWalt DC970K-2 drill has dual speed range (two setting): 0 to 500 rpm and 0 -1500 rpm (rpm = revolutions per minute). The Black&Decker LDX120C has a single range: 0 to 650 rpm. Note 4: The chuck holds the bit and provides for precision and accuracy. Note 5: On a power drill, the clutch setting controls the amount of torque that the motor will transmit to the drill chuck. Note 6: DeWalt also gives a 90 day money back guarantee. Note 7: The prices shown were in effect when this article was written and may have changed. Note also that Amazon prices include usually a good discount on the List Price. Please refer to the Amazon section below to check exact prices. So, which of the two drills is best to buy? Power: The DeWalt DC970K-2 is clearly more powerful since it can reach speeds up to 1600 rpm while the maximum speed for the Black&Decker LDX120C is 650rpm. Batteries: The DeWalt DC970K-2 uses nickel-cadmium (NiCad) batteries while the Black&Decker LDX120C uses lithium-Ion batteris. NiCad batteries offer better performance in cold weather and longer lifespan than lithium-ion batteries (7-8 years for NiCads versus 3-5 years for lithium-ion). Note however that NiCad batteries are also more susceptible to suffer from what is called the "memory effect" whereby the batteries gradually lose their maximum energy capacity if they are repeatedly recharged after being only partially discharged (the batteries appear to "remember" the smaller capacity). The way to avoid the "memory effect" is to fully charge and then fully discharge the battery at least once every two to three weeks. So, both battery types have their pros and cons, and the merits of each type have been the subject of many discussions and arguments with no clear winner. LED Work Light: For those who need to work in darker conditions, a built-in LED light that illuminates the drilling area can be very useful. Of the two drills, only the Black&Decker has a built-in LED light. If a DeWalt drill similar to DC970K-2 but with an LED light is desired, then the DC720KA should be considered. Not only does it have a built-in light, it is also more powerful than the DC970K-2. But as to be expected, it is also more expensive than the DC970K-2 (see Amazon products section below). Clutch Settings: The clutch setting controls the amount of torque that the motor will transmit to the drill chuck. The DeWalt drill give you more settings than the Black&Decker (17 settings vs. 11). Warranty: The Dewalt warranty is much better than Black&Decker's: 3-Year vs. 1-Year. In addition, DeWalt has a 90-day money back guarantee. All this simply means that DeWalt has high confidence in the quality of their products. Note that Amazon usually provides a good discount with respect to the List Price. If a discount exists, both the List Price and the actual Amazon price will be shown when you click the product images below. This unit is lighter and delivers more power than the DC970-K2 (4.8 lbs and 480 Watts), and comes with built-in LED worklight. Like the DeWalt DC970-K2, it comes with the charger and two batteries. This is the Amazon #2 top selling cordless drill compared above.